Bella Harris isn’t your typical 17-year old high school student. Bella is a young lady who has many aspirations and an innate entrepreneurial spirit. Bella has successfully been pursuing modeling and is in fact, working for some of the top designers in the world. Bella started her modeling career when she was 13 and is now walking the runways at NY Fashion Week and has recently shot an ad for NIKE. Pretty awesome if you ask me! Bella has a keen work ethic when it comes to modeling and academics and certainly has it in her genes just like her father, Jimmy Jam, a famous record producer and the Chairman of the Grammy Awards Association. She also gets her business acumen from her mother Lisa, her Momager, who is showing her the ropes in the fashion and business world. Bella is grounded, poised and focused on maintaining excellent school grades. She is bright and talented and is making her mark on the fashion industry and no doubt will spread her talents across the world. Beauty and brains indeed! MJ: How old were you when you started modeling and how did you get your start? BH: When I was 13 1/2, I was scouted. I was at the Grammy Awards that year and I met two agents who showed interest and set up meetings with me shortly thereafter. I signed with my first agency right before my 14th birthday. I was in development, working on my book and having test shoots. I started booking jobs and working when I was 15 years old. MJ: What runways have you slayed? BH: I had to wait until I turned 16 to walk in NY Fashion Week. The first three shows I did were Naeem Kahn, Alice + Olivia and Sherri Hill. It was a dream come true. MJ: Are there any designers that you would like to work for? BH: There are so many great designers I would love to work for, but Dolce & Gabbana and Versace are at the top of my list right now. MJ: Any fashion shows coming up? BH: Yes, NY Fashion Week is in February. I am still in high school so I limit my time to just four days at fashion week, but I still enjoy the amazing experience. MJ: Has your twin joined you on the runway? BH: I have never done a runway show with my twin brother Max. We both did a Forever 21 campaign on the same day and that was the closest we have come to working together. MJ: What do you enjoy more, print or runway and why? BH: I like them both for different reasons. Print is so artistic and creative in a more confined setting where you wait and see how it turns out. Runway is more of an immediate and quick burst of self-expression. It’s a collective effort where you feed off the energy of the other girls. The energy is palpable, then it’s all over in minutes. MJ: What is your favorite print ad that you shot so far? BH: I did a Nike ad for the relaunch of the Cortez shoe. It was a collaboration with Teen Vogue. We shot it on Venice Beach in LA and the pictures were amazing. I got to work with some really cool models and establish some great friendships. MJ: Let’s talk designers. Who are some of your favorites to wear when you are casual? Swimwear? Night time? BH: For swimwear, my favorite brand is Frankie’s Bikinis. The owner/creator Francesca Aiello went to my high school, so it’s nice to support my friends and people I grew up around, plus her swimsuits are gorgeous! I like to mix designer brands with brands like Zara or Forever 21. Zara has a lot of nice outerwear jackets that I’d mix with a top from Alexander Wang and pair that with Rag and Bone jeans and boots. I am also loving everything at Gucci. The first handbag I ever bought with my own money was from there, it was a proud moment for me. MJ: Your mom is your Momager and best friend and I know she’s an amazing lady. Has working together made your relationship stronger? BH: My mom is incredible! She goes to all of my meetings with me, she fields all of the requests that I receive and travels with me. Before I learned to drive, she drove me to all of my castings and believed in me from early on. Our relationship was always good and it has only become stronger. We trust each other completely! My manager is a great guy from my New York agency who has believed in me from the start. MJ: What are some of the lessons mom has taught you while being on the road together? BH: She taught me the importance of being on time. Being late can be careless and changes the energy of a meeting or a shoot. When you are late, you spend the first 5 minutes explaining, making excuses and apologizing which starts the day off negatively, not positively. She also instilled very good manners and how important it is to be polite and work hard even if you hate the job. A career is a marathon, not a sprint. MJ: Being the daughter of “Jimmy Jam”, a famous record producer, do you think he would like to see either you, Max or Tyler follow in his footsteps? BH: Of course, that would be cool for my dad to see. My brothers do love music as well as creating music. Max actually makes a lot of songs and wants to make an album soon. I believe he might be the one to follow in my dad’s footsteps. MJ: Who are some of your favorite music artists that you have downloaded to your playlist? BH: I love listening to alternative music, so some of my favorite artists from that genre are Mac DeMarco, the 1975 and Coldplay. I also listen to a lot of R&B and my favorite R&B artists are Brent Faiyaz, Miguel, Daniel Caesar and H.E.R. MJ: I know your parents are very generous and give to various charitable organizations? Do you have a favorite charity that you have connected with? BH: My favorite charity is the Juvenile Diabetes Research Foundation (JDRF). My twin was diagnosed with type 1 Diabetes, so it has been an organization that we have been connected to since we were 2. He recently received an award from JDRF for his courage and he has inspired many young kids by being a star athlete with diabetes. MJ: Any advice you can share with other inspiring models? BH: My advice is to go out there and achieve your goals. Now with social media, it is easier to get your name and photos out there, no matter where you live but you have to remain strong. It can be difficult because it is a business that judges your appearance. It can also be hard when you don’t get booked for a job, but you can’t dwell over the situation. Often times, they are looking for a specific type and they already know what they want so you can’t take it personally! MJ: What is your favorite girl power motto? BH: Girl power starts with believing in yourself. It’s important to lend support and help to empower other women. Stand up for them and help them when they are down. As women, we must stand together and build each other up, not tear each other down. MJ: What do you see as your next career once you retire from modeling? BH: I really do love everything about fashion. Once I graduate from high school, I plan to attend either FIT in New York or FIDM in Los Angeles. I have been offered so many great opportunities as an influencer and growing my brand. Hopefully, I don’t have to retire from any one thing. I hope to combine all of my ambitions into one long career that includes fashion, lifestyle, music, modeling and international business. I also hope to inspire other Generation Z kids to do the same. MJ: Thank you for taking the time to share your journey with us and I look forward to seeing you walk the runways and doing many great things in the world. Good luck with it all! BH: Thank you and it was my pleasure. Web and has been recognized in a story that ran in Forbes, "How I Made It In A 'Man's' Field: 5 High- Powered Women Tell All." 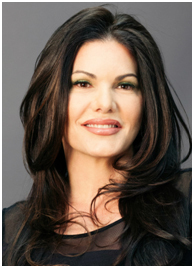 MJ is one of the top female entrepreneurs to receive the Puglia’s Award of Excellence for Public Relations & Nonprofit Leaders as well as the Top Women in Business Award and is expanding globally as her strategic efforts have helped many nonprofit organizations collectively raise millions of dollars throughout the years. MJ is a member of the National Association of Professional Women (NAPW) and the Public Relations Society of America (PRSA). MJ was a contributing writer for Media Magnetism and Motivational Speaker 101 in which she wrote the Forewords, is a ghostwriter for the Impact section of the Huffington Post in which she writes on behalf of her notable clients and is the Men’s Fashion Editor for Social Life Magazine. MJ is a sought after speaker and expert panelist who speaks on various topics. She is the host of a high profile celebrity-based podcast, Live With MJ! and is the Co-Founder of the Giving Carpet, a social, philanthropic video news network which focuses exclusively on the charitable efforts of celebrities during high-profile red carpet events and enables supporters to virtually attend and donate funds from anywhere in the world. Moreover, MJ is an investor in the animated film, Henry & Me that stars Richard Gere, Danny Aiello, Chazz Palminteri, Cyndi Lauper and the cast of the NY Yankees and was released to theaters in August 2014.